Zahirod-din Tahir Bin Mohammad Al-Faryaabi was born around 950 years ago in Paryaab, which in Arabic pronounced as Faryaab (Arabic has no sound for ‘P’ replaced by ‘F’), a city in eastern regions of Khorasan. His elementary education took place in his birth city but his higher education for six years commenced in Nayshaboor, Iran. Apparently he was a prodigy of his time. He made his living by writing praises for kings and governors and indulged himself, by his own admittance with no shame whatsoever, in pleasures of life. His general conduct and ethics has left a little to be desired and again he was not hiding anything and was very honest about his vices. He is a perfect example for today’s Muslim writers and poets. Let a man indulge out of weakness or wickedness in pleasures of life, but in the moment the pen touches the paper, let Iman (faith) focus into a laser beam and blind his eyes, bore the words and poems into the hearts. In this day and age especially in the west, a man cannot be perfect in all aspects of his Islamic religion. He must accept, beyond any false pretense, that he is negligent at times and must focus all spiritual energy into few moments when he performs his art. 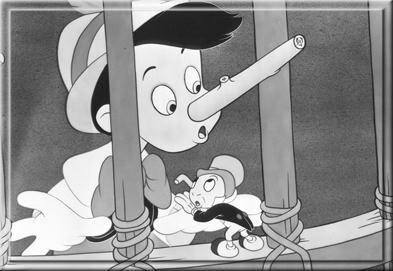 For this reason I have decided to use the artwork from Pinocchio! This doll strived hard to transform his wooden body from under the control of other men into a real innocent boy. Faryaabi, myself, and yes you! The reader must leave our current personalities behind and strive hard like Pinocchio against all the mistakes made in Pleasure Island and seek the sanctuary of our Creator. For those of you whom do not share this view, please leave my web pages alone, go somewhere else and admire your arrogant self.